Virginia bill allowing more counties to avoid prison-based gerrymandering passes Senate unanimously, goes on to Governor for signature. The morning, the Virginia Senate unanimously passed HB 13, which would allow more counties to avoid prison-based gerrymandering. I submitted testimony in support of the bill this on Tuesday. 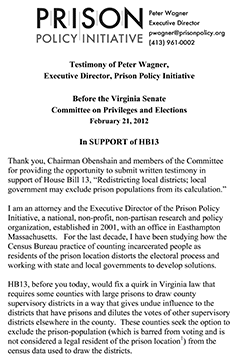 HB13 fixes a quirk in Virginia law that requires counties with large prisons to engage in prison-based gerrymandering. These counties must use Census Bureau prison counts to draw county supervisory districts, thereby granting undue influence to the districts that have prisons and diluting the votes of residents in all other supervisory districts in the county. Prior to 2001, all Virginia counties were required to engage in prison-based gerrymandering; but that year Virginia amended the law, giving some counties — if their total incarcerated population was at least 12% of the total county population — the option to exclude prison populations for redistricting purposes. Counties with slightly smaller prison populations were still required to use the prison populations to dilute the votes of other county residents. HB 13 would give any county with a single district that’s 12% or more incarcerated the opportunity to avoid prison-based gerrymandering. The bill, which earlier this month unanimously passed the House, now goes on to the Governor for signature. In an editorial last month, the Roanoke Times editorial board declared that HB 13 “would move the commonwealth in the right direction” towards ending prison-based gerrymandering. Virginia bill allowing more counties to avoid prison-based gerrymandering passes Senate Committee on Privileges and Elections. Prison Policy Initiative urges Governor Brown to sign California’s bill to end prison-based gerrymandering. New Virginia bill (HB 1339) to end state’s requirement that some counties engage in prison gerrymandering passed House, is making its way through Senate.